Milwaukee has really been trying to step up their networking game lately, and making sure to include the creatives in the city. Every other day I see a new event I’m invited to on Facebook where creatives are coming together to meet and possibly collaborate on projects. The most recent event I went to was the MKE Industry Mixer, hosted by DJ Rickey Allenz from v100.7. This mixer was packed with people in the music industry from popular DJ’s to local artists, radio personalities and more. I tried to talk to a little bit of everybody in each category to see what they thought of the event to really give y’all a good feel for what went down if you missed out! DJ Rickey Allenz was the mastermind behind this beneficial event, and for this to be his first one, he did a bomb job. 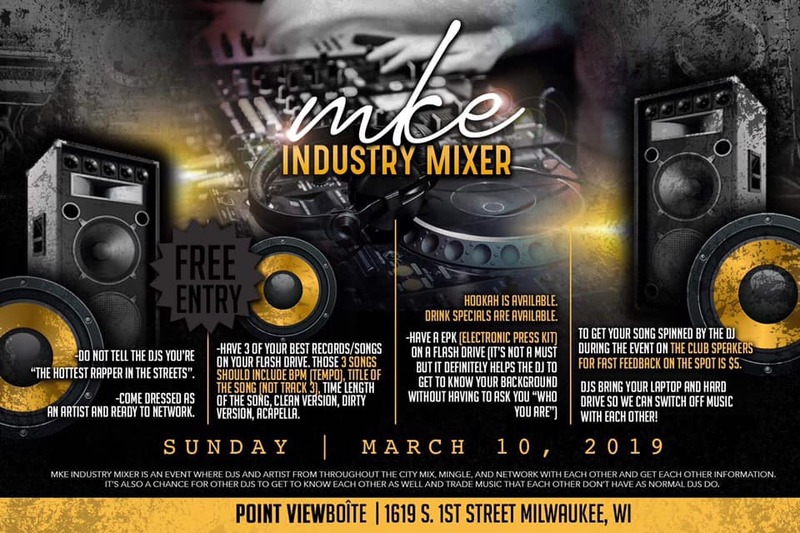 He wanted to have the industry mixer because he feels like he’s in tune with a lot of Milwaukee artists, however, some DJ’s just don’t know what’s currently hot in the streets. The point of the mixer is to bring artists together with DJ’s because in hindsight, artists without DJ’s are practically nothing. The DJ is the one who’s going to play your record in clubs, on the radio, etc. They can help spread your music to a wider audience who might not normally get to hear it on a regular basis if, for example, the artist mostly promotes it within their own community. DJ Rickey Allenz is a DJ for v.100.7, WNOV and KBBG 88.1 in Iowa. Other DJ’s have connections in other cities as well, so if they know you and like your music, they can promote your songs in those areas. That is called a PLUG ladies and gentlemen! Allenz used to be an artist himself, but he didn’t know the game well enough, so he fell off of it. He said some DJ’s will hustle an artist and charge them money to play their music and then possibly not fall through with actually playing it. That’s not what Allenz is about. If he likes it, he’ll play it, simple. He’s always willing to help an artist grow and put them on game if they’re willing to help themselves. Two artists who I was able to speak with at the industry mixer were @NuMoney2mm and @_sgodjayy. They both came and either performed or had their music played that night. NuMoney performed one of his songs, and he says the DJ/Artist duo is a great relationship. The artist has a product the DJ demands and the DJ can be the start of everything. He says, you never know a connection someone might have with someone else who can get your foot in the door. @_sgodjayy had one of his songs played and was literally geeked when his song came on lol. Jayy says every platform is a good one, it just depends on how you use it. He gets excited for his music and takes pride in his craft and creativity because “when you take pride in what you do, it shows.” You have to have confidence, he says, or else you’ll limit yourself. I met the lovely DJ Trustar, aka the Trap Princess and the first female Core DJ in Milwaukee, and she says it’s important for DJ’s to come to events like the mixer. Sometimes DJ’s don’t talk on the mic and artists don’t know who they are so it’s good to get your face out there. For example, a lot of people don’t even know she IS DJ Trustar, since she doesn’t talk on the mic much, if at all. People are usually surprised when they find out she’s a woman, especially since she really knows how to throw down on the 1s and 2s, which usually isn’t expected from a woman DJ (btw, that’s a whole topic for a different day that can be dissected when y’all are ready lol). Lastly, I spoke to the very personable radio personality, Promise from v.100.7! A few Milwaukee artists might know him from his radio segment, “Heat from The Street.” Promise resurrected the segment when he first came to v.100.7 because he wants to help artist get more exposure. Promise tries to be pretty hands on as far as trying to make sure the city hears different sounds and styles, because a lot of the time people get boxed into whatever part of the city they’re in. He also says social media has ironically made people antisocial. Promise says, “In the music industry everybody wants to be heard, but a lot of people don’t know the right approach.” Networking events like the mixer are a great opportunity for media professionals to interact with artists and put them on game. It gives them a chance to get in front of each other and learn how to talk and be more personable instead of hiding behind a screen. Also, it helps for people in the industry to put a name with a face or a face with a voice. Overall, I thought the event was a great opportunity for people in the industry to mix and make those connections to further grow their careers. There weren’t just DJ’s in attendance either, club promoters, music producers, sound engineers and other journalists with media platforms came as well, s/o to Brittani and A Sit with Britt. My only concern was the fact that there weren’t a lot of artists there. The DJ’s did their part and showed up. I was introduced to plenty of them such as, DJ Heathen of v.100.7, DJ devast8 and DJ Cell of the Recordbreakers, etc. I’m not sure if it was the promotion of the event, artists just not wanting to come or what. But, I see a lot of artists complain that there aren’t events like this, then when there is, no one shows up. Like I’ve tried to drill into your brains throughout this entire article, this industry mixer was a great opportunity for everyone involved, so if someone can let me know the reason why more connections weren’t made on the artist side, please enlighten ya girl! Hopefully DJ Rickey Allenz and other DJ’s throw more networking events like this in the future because the concept is great and can really elevate the music culture here in Milwaukee (which you know CW is all for).